If you stress that your oven has to work overtime during the holidays, you’re not alone. It’s not just the turkey that needs to be cooked after all. Roasting a turkey takes time so having an electric roasting oven that you can use in addition to your conventional oven allows you to multi-task and have the complete holiday dinner ready in time without pulling your hair out! Our best electric turkey roaster reviews will help you find the most efficient models available today. Another benefit that you get from roasting a turkey in a roasting oven, is that you don’t have to baste it every half an hour like you do in a traditional oven. Since the roaster steams as well as roasts, there is enough moisture for the meat to cook in its own juices. In fact, the juices drip down into the roasting pan and can be saved to make an awesome gravy. A roaster also uses less power, reduces cooking time and doesn’t heat your home – a positive if you live in less wintry climes. For dishes smaller than a turkey and when you need to grill too, you could consider a countertop toaster oven that you can use on a daily basis. If you’re looking for an extra crispy skin and are not concerned with cooking with oil, consider an indoor turkey fryer too. You have to keep a meat thermometer handy, as you want to be sure that the inside of a turkey or large cuts of meat are fully done. Most times you’ll need about 4-5 hours for a turkey to be done. Take a look at some top rated electric roasters for turkeys here or continue reading for our top picks. Note: Some users say that they don’t get an actual roasted effect with a golden brown skin on their turkey with roaster ovens. This is because the method of cooking is different from conventional ovens. You can absolutely get a good roasted look and flavor if you resist the urge to lift the lid to check on it every few minutes and brush a mixture of oil and salt on the skin first. For a foolproof method for cooking a turkey in a roaster oven, try this recipe by Squirrel Gone Wild on Food.com. If you find that the skin still hasn’t browned, finish off the last 30 minutes in a regular oven under the broiler. If you don’t have another oven, use roasting liners during the process next time. If crispy skin is an absolute must, you could also consider an electric rotisserie that can be used at home. The Proctor Silex 22 Quart Roaster Oven is a durable and versatile roaster, able to grant you a second countertop oven. It is the new version of the popular Hamilton Beach 32229 oven. The 32230A oven allows you to bake and roast with less electricity and without raising the heat in your home. Save money and enjoy your summertime roasts, even on the hottest days. It even helps reduce cooking times by up to 30%. Make sure you keep a meat thermometer handy and keep an eye on your first few dishes as you learn to adapt your recipes. At 22 quarts, this versatile large turkey roaster with lid is big enough to house a 9×13 pan, two 9×5 loaf pans, or a bundt cake pan to allow simultaneous baking while dinner is in the oven. Temperature settings from 150-450F allow you to keep food warm, slow cook, roast, and bake. There’s enough space inside to house a 20 lb bird, double roasts, or a crowd-pleasing portion of chili. Available buffet pans and a serving lid allow the pan to do double duty for buffets during large gatherings. You can use this roaster to slow cook stews or sauces by setting it at 225F and letting it cook for at least 4 hours. You can steam vegetables by filling the insert pan with some water and placing the veggies on the rack, which you then place over the pan. You can even bake a cake or bread by placing the filled pan on the rack. The metal lift-out rack makes it easy to pull large roasts, turkeys, and pans safely from the oven and provide circulation space for your own bakeware. This roaster is solidly built and made to last, though the lid is a little less sturdy than the rest of the unit. Expect fall-part tender meat, but be prepared to use a roasting bag or browning liquid to get the crisp exterior that you’re used to in your conventional oven. Moisture might steam rather than crisp the exterior. Be aware that the unit itself gets hot to the touch, so keep it away from little fingers. Like the Proctor Silex model, the Rival roaster oven offers temperature ranges from 150-450 degrees Fahrenheit. It does a fantastic job of creating most roasts and birds while offering you the versatility to prepare yeasted bread, cakes, stews, and steamed vegetables within as well. Your oven can be freed up to make other dishes while this roasts away on a countertop and takes up to 77% less energy than a traditional convection oven. This model, available in white or black, offers a removable steel roasting rack and an enameled steel roasting pan that can be removed to clean. Cleaning it after use can be a tricky affair. The roasting pan is very large and may not fit in every sink. The surface, an enameled steel, is not non-stick, so be prepared to use a little elbow grease while cleaning. It’s a bit smaller inside at 18 quarts but is still large enough to host an 18lb turkey or two 12-lb spiral hams in a 9”x13” pan. Like the other roasters, you may want a roasting bag or browning liquid to get the look of traditionally roasted meat. Expect the exterior to get hot to the touch and be wary of the unit running hotter than the gauge shows. Use a meat thermometer and watch your first few dishes as you learn to judge accurately the cooking times. The cord is very short so this roaster will have to be close to the power source. This is another 18 quart oven that will fit an 20 pound turkey and allow you to steam, slow cook and bake. With the Oster CKSTRS71, you get a removable roasting pan, steel rack and lid with its own rest for when you need to stir or serve. For parties, there’s a buffet server included with 3 pans and their lids, so it is a true multi-tasting piece of equipment. Once all your cooking is done, remove the roasting equipment and replace with the buffet server trays. This oven also heats between 150°F and 450°F, so you can do everything from roasting a turkey to keeping the buffet items warm. 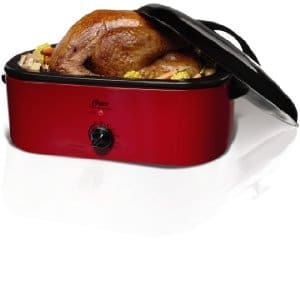 In fact, its light weight and compact housing makes this the best electric roaster oven for turkey and other foods. While smaller than the other roasters, the Oster CKSTROSMK18 Smoker and Roaster model is packed with unusual features that make it a dynamic and impressive kitchen and outdoor cooking accessory. In addition to roasting, steaming, slow cooking, and baking, the Oster Smoker Roaster features removable corner pockets that house smoking chips. You’ll need to do your smoking outdoors, but you can pack a lot of flavor in with this energy-efficient model capable of holding a 20-lb turkey or two roasting chickens within its 16 qt. interior. Like the other models listed, the internal roasting pan is enamelled steel is removable for easier cleaning. The roasting rack is a little trickier to remove than it’s competitors options. It rests on the bottom of the roasting pan. This helps keep your baking dishes lifted off the heated surface to allow for great heat circulation, but the lack of lifting handles makes it a bit more challenging to get those dishes back out. When smoking meats, this roaster requires fewer chips and no charcoal compared to a more traditional smoker, resulting in tender, flavorful meats with less expense and hassle. The smoking process is a little easier for a beginner to learn on because the electric heat means even and steady temperatures and you don’t have to light the chips yourself, as the heat from the oven gets them to smoulder. As a result, you can expect more consistent and higher quality results than you would learning with a typical smoker. You will want to acquire a suitable extension cord for outdoor use, since, like its competitors, it offers a short cord. It will create a lot of smoke when used with chips, so plan to take it outside for any smoking. It has exterior cool-touch handles, but the unit itself will still get toasty warm. Keep it away from kids and pets. Of all the available models, this is arguably the most attractive electric roasting pan with a bright cherry exterior and sleek black lid. For even faster cooking of your turkey and other foods, you could try the NuWave Pro Plus Oven that uses a combination of infrared, convection and conduction cooking. You can get a 16 pound turkey or 14 pound ham done in this with great results. You can either manually set a cooking temperature between 100 and 350 degrees F or use a preset of warm, reheat or delay, where the last option lets you set it to start cooking at a later time. All this is done via the digital control panel. It can cook for up to 10 hours but saves 75% on energy and is 70% faster to cook. There is no need to preheat it like you do with regular gas, toaster and convection ovens and you can put frozen foods directly in it and still turn out perfectly cooked food. While the old clear dome that covers the food while cooking had quality issues, the new and updated amber Polyetherimide dome is durable and long lasting. It also comes with a reversible cooking rack, a second cooking rack, a porcelain enamel drip pan and a stainless steel extender ring that increases the height within the cooker for large turkeys. Another useful thing is the dome holder that you can rest the dome on when you need to check on the food being cooked. This unit is light and portable so you can take it with you to a cook out or barbeque. Everything but the cooking base is dishwasher-safe.